Community Choice Credit Union kept lending while the economy tanked and now is riding a new wave of MBL activity. Community Choice Credit Union has expanded its statewide MBL activity. Close management of business loans keeps delinquency to nearly nil. Community Choice Credit Union ($1.0B, Farmington Hills, MI) has a decade-long record of member business lending growth. 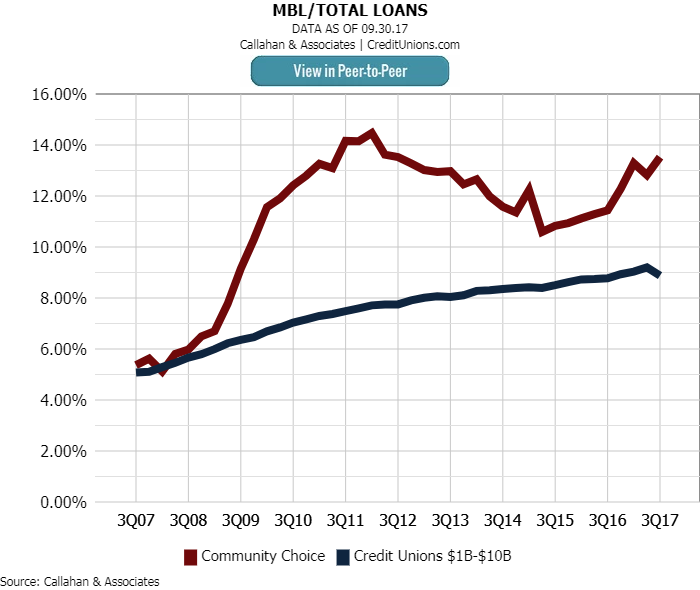 CCCU’s MBL portfolio was $106.5 million as of third quarter 2017, a 30.49% jump from the year-ago quarter and sharply higher than the 13.65% rate recorded on average by the 280 credit unions in the $1 billion to $10 billion asset class. Business lending, in fact, has been strong for at least the past 10 years, when its average MBL balance first topped $200,000. It now sits at $224,739. Community Choice kept making business loans even during the financial crisis and today lends more on average than credit unions its size. 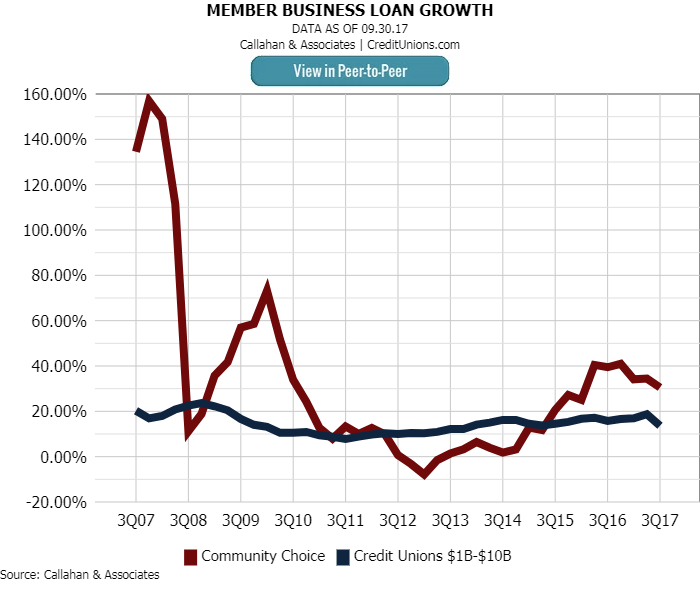 A quick look at the growth chart above shows a sharp rise in CCCU’s member business lending activity during the darkest days of the Great Recession. That’s when the cooperative proved it was there for its members, lending when others wouldn’t. Even more notable is that CCCU operates in one of the hardest-hit areas of the country. Mayer says the credit union did that by providing workouts or new loans to borrowers in need. And by helping member take advantage of the market conditions around them, making loans that also helped the local economy seek an even keel. Another MBL surge began in late 2014, after the suburban Detroit credit union added three business relationship lenders to bolster activity in its service areas in central and western Michigan. Now, working with a CUSO and a built-out staff of its own, the credit union has the infrastructure is in place to keep the production growing. CCCU serves 12 counties across the Lower Peninsula, as well as SEGs that include Kelly Services and some General Motors divisions. Its MBL growth, although notable, parallels its overall loan growth. Peer-to-Peer provides the context needed to judge the effectiveness of your MBL efforts. Learn more. For the past 10 years, Community Choice has consistently had a higher ratio of business loans to total loans than its peers. CCCU is designated as a Low Income Credit Union by the NCUA, and thus is immune to the MBL cap, and it has long had a higher than average concentration of business loans. As of third quarter 2017, its business lending represented 13.53% of its total portfolio, compared with 7.83% for the average billion-dollar credit union. Here are some member business tips from Teresa Mayer, chief lending offer at Community Choice Credit Union in Farmington Hills, MI. Be there in tough times. Community Choice helped members take advantage of a soft market to make timely commercial investments. Manage relationships, not just accounts. Community Choice keeps delinquencies low by closely monitoring loan payments and checking activity, and reaches out when it sees signs of trouble. Grow with your members. Community Choice is expanding its business services to include an array of deposit, cards, and other money management options, as well as digital back-office services. Its borrowers represent a diverse group of entrepreneurs, including an ice cream business, a veteran opening a butcher shop, and a shoe shop whose proprietor specializes in making boots. But Community Choice doesn’t want to stop at lending money. That’s why it’s expanding its business services, which now includes checking programs, remote deposit capture, money market accounts, and business debit and credit cards. The credit union is also rolling out a new digital back-office functionality offering called Autobooks. One striking statistic for Community Choice: Delinquencies in its MBL portfolio were zero for seven straight quarters beginning in the second quarter of 2015. That crept up to only 0.28% in the third quarter of 2017, compared with 2.05% on average for credit unions between $1 billion and $10 billion in assets as of Sept. 30, 2017. That loan performance results from aggressive monitoring and relationship management by the staff of four commercial lenders and a junior lender whose primary job is loan production and managing the borrower relationship. The credit union catches those missed payments because its staff runs monitoring reports daily as well as weekly to catch red flags, such as a bounced check. It also monitors deposits and has a collateral manager in place. Close relationships between lending and collections makes a difference, and so does the relationship with the members themselves, adds Barb Babington, assistant vice president of lending.